When finished, products made from plastic take many different forms, but they all start in the same place and of the same raw material – resin. In plastic extrusion, resin beads are melted down, filtered for uniform consistency, pushed through a die cut for the final product shape, and then cooled. Plastic extrusion is used to produce a wide range of products on the market, from building materials to consumer products to industrial parts. Pipes, window frames, electrical covers, fence, edging, and weather stripping are just a few of the common items made by plastic extrusion, along with thousands of custom profiles. The process itself is highly technical. However, it can be summed up in just five steps. Step 1: Raw plastic materials like granules, pellets, or powder are loaded into a hopper and then fed into a long heated cylindrical chamber called an extruder. It is moved through this chamber by a revolving screw. Some extruders can have either one or two revolving screws. Step 2: The raw materials flow from the hopper down through the feed throat and onto a large spinning screw operating within a horizontal barrel. Step 3: Not all materials have the same properties, so the raw material is processed by a heating temperature specific to the type of raw material being passed through. At the end of the heated chamber, the molten plastic is forced through a small opening called a die to form the shape of the finished product. 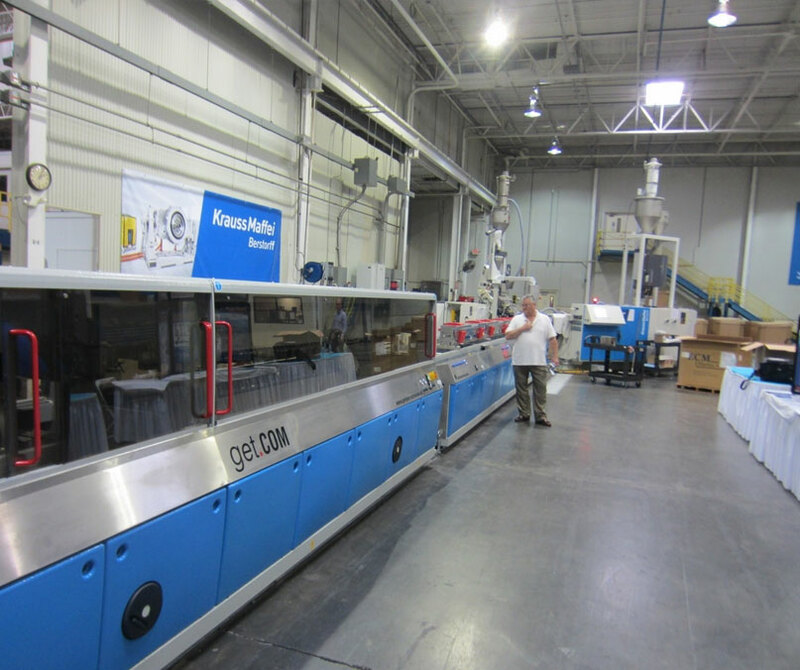 Step 4: As the plastic is extruded from the die, it is fed onto a conveyor belt for cooling. Cooling can happen by air or water. The process is similar to the injection moulding process except that the melted plastic is forced through a die instead of into a mould. Step 5: The die for an individual plastic profile is designed so that the plastic flows smoothly and evenly from the cylindrical profile of the extruder into the final profile shape. Consistency in this flow is critical to achieving an end product with integrity.